Don't confound this small regional state with the later and larger Wei 魏, one of the successor states of Jin. The state of Wei 衛 (correctly written 衞) was a regional state of the Zhou period 周 (11th cent.-221 BCE). As a small state of the Central Plain, it had always to cope with the ambitions of the larger states around. The territory of Wei was located in the northern parts of the modern province of Henan. Map according to Tan Qixiang 谭其骧 (1987), Zhongguo lishi ditu ji 中国历史地图集. Wei was located in the eastern parts of the Yellow River Plain. It was a weak state, but survived until the foundation of the Qin empire. Click to enlarge. The state of Wei was entrusted to Kang Shu Feng 康叔封, a brother of King Wu of Zhou 周武王. The inhabitants of the state of Wei were subjects of the former Shang dynasty 商 (17th-11th cent. BCE), which had first been ruled by Lu Fu 祿父 (Wu Geng 武庚), a prince of the Shang, but after his rebellion, they came under the rulership of Kang Shu Feng. The Duke of Zhou 周公旦, regent for King Cheng of Zhou 周成王, proclaimed an instruction to Kang Shu, the Kanggao 康誥 (a chapter of the Shangshu 尚 "Book of Documents"), and admonished him to avoid wine and women, because these were the factors by which the last ruler of the Shang was believed to have lost his kingdom. There were two further instructions to Kang Shu, namely the Jiugao 酒誥, and the speech Zicai 梓材, all three of which are included in the historiographical classic Shangshu 尚書. When King Cheng took over regency, Kang Shu was made Minister of Justice (sikou 司寇). The name of Kang Shu is mentioned on a gui 簋-type bronze vessel called Kang hou gui 康侯簋. In the seventh generation, the rulers of Wei were promoted to marquesses (hou 侯). 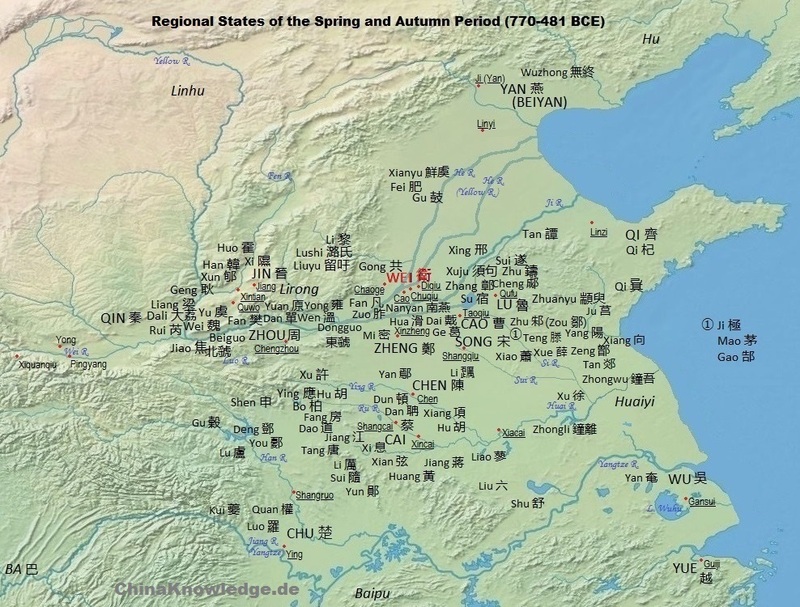 The most ancient generations were still called rulers of Kang 康 (near modern Yuxian 禹縣, Henan). It is not known when exactly the name of the state was changed from Kang to Wei, yet "wei 衛" seems to be a term describing the political function of the territory of Kang, namely as "guard" of the eastern capital Chengzhou 成周 (Luoyi 雒邑, modern Luoyang 洛陽, Henan) against the native tribes in the east. The oldest son of Marquis Xi 衛釐侯 (r. 855-813) was Prince Yu 餘 (posthumous title Earl Gong 共伯). He was challenged by his younger brother Prince He 和, who attacked him with some retainers. Earl Gong commited suicide at the tomb of his father and was buried at his side. Prince He was enthroned as marquis. During the flight of the Zhou princes to the east in 770, Marquis He supported King Ping of Zhou 周平王 (r. 770-720). He was subsequently promoted to duke (gong 公), with the posthumous title of Duke Wu 衛武公 (r. 812-758). Duke Zhuang 衛莊公 (r. 757-735) had several sons of different wives. Prince Wan 完 was made heir apparent. Prince Zhouxu 州吁, son of a concubine, loved weapons, and therefore his father wanted to appoint him a general. The Duke's advisor Shi Que 石碏 warned his ruler to give military power into the hands of a younger son, because this would endanger the dynastic peace. The Duke ignored this premonition. In fact, when Prince Wan became Duke Huan 衛桓公 (r. 734-719), he had to demote Prince Zhouxu, who consequently fled abroad. In exile, he assembled enemies of his brother and finally managed to kill him and make himself the ruler of Wei. Shi Que went to the state of Chen 陳, where Duke Huan's mother had came from, and prepared the backlash. On a visit to the duke of Zheng 鄭, Zhouxu was killed, and Prince Jin 晉 was invited to mount the throne, as Duke Xuan 衛宣公 (r. 718-700). Duke Xuan's son Prince Ji 伋 was raised by his uncle, who wanted to marry him with a princess from the state of Qi 齊. When the Duke saw the bride, he took her into his own harem and gave his son another wife. The princess bore him three sons, which the Duke loved more than the heir apparent, Prince Ji. Together with Prince Zishuo 子朔, a son of the Qi princess, the Duke planned to have Prince Ji murdered during a campaign. But Zishuo's brother Prince Zishou 子壽 warned the Prince, but Prince Ji declined to refuse obedience to his father. Therefore, Zishou himself carried the white banner that should serve the assassins as a signal as whom they had to murder. Prince Zishou was killed instead of Prince Ji. Yet instead of to flee, Prince Ji declared to the assassins that he was the right person to be killed, and he was murdered, too. Prince Zishuo was made heir apparent and later mounted the throne as Duke Hui 衛惠公. The members of the nobility in Wei were not content with a murderer as their ruler and forced him into exile to Qi. Instead, Prince Qianmou 黔牟 was made ruler (r. 696-687). After several years, the duke of Qi undertook a campaign to reinstall Duke Hui (r. 686-669). Prince Qianmou fled to the court of the king of Zhou. Duke Hui therefore asked the duke of Yan 燕 to support him in a punitive campaign against Zhou. The campaign succeeded, and Duke Hui of Wei forced King Hui of Zhou 周惠王 (r. 676-652) into exile in Wen 溫, from where he only returned four years later. In the meantime, Prince Tui 頹 reigned for the exiled king. During the reign of Duke Yi 衛懿公 (r. 668-660), Wei was invaded by the Di 狄 tribes. The country was devastated to such an extent that five thousand people had to be fed by the duke of Song 宋 and were brought to the state of Cao 曹 to seek shelter. The hegemonial lord (ba 霸) Duke Huan of Qi 齊桓公 (r. 685-643) thereupon ordered constructing a fortification on the hill Chuqiu 楚丘 (west of modern Puyang 濮陽, Henan), where the new residence of the duke of Wei was built. Duke Yi was demoted by a rebellion of discontent nobles who enthroned Prince Shen 申, a nephew of Prince Qianmou, known as Duke Dai 衛戴公 (r. 660), but he died after only a few months of reign. The state of Qi more and more controled the fate of Wei and installed Duke Wen 衛文公 (r. 659-635). When Duke Wen escaped a rebellion to the state of Qi, the duke of Qi sent him back. The rule of Duke Wen is generally described as benevolent, with low taxes and a relaxed penal law. The state could recover from the stroke by the Di people in the 660s and even conquered the statelet of Xing 郉. When the duke of Jin 晉 passed Wei, Duke Wen of Wei did not treat him with the appropriate respect, a behaviour that had consequences. Under Duke Cheng of Wei 衛成公 (r. 634-600), the army of Jin wanted to pass the territory of Wei in order to bring relief to the state of Song. Duke Cheng refused, and therefore the army of Jin attacked Wei, expelled Duke Cheng into exile in Chen, and seized part of the territory of Wei. After two years, Duke Cheng asked the king of Zhou to negotiate peace with Jin, but the duke of Jin sent a murderer to poison Duke Cheng of Wei. The Duke managed to bribe the murderer so that the dose was not sufficient to kill him. The king of Zhou mediated, and Duke Cheng could return. He punished the nobleman Yuan Xuan 元咺, who had sided with Jin, and exiled the regent, Prince Xia 瑕. In 629, the Di tribes attacked Wei again, so that the ducal seat was transferred eastwards to Diqiu 帝丘 (modern Puyang 濮陽, Shandong). Duke Xian 衛獻公 (r. 576-559) once had the music teacher of his concubines beaten because he did not treat well his disciples. Two nobles, Sun Wenzi 孫文子 (Sun Linfu 孫林父) and Ning Huizi 寧惠子 (Ning Xi 寧喜), were enraged because the Duke went out hunting instead of receiving them at the banquet to which he had invited them. They rebelled, forced Duke Xian into exile in Qi, and enthroned Duke Shang 衛殤公 (r. 558-547). The two nobles fell out with each other and thus created an opportunity for Duke Xian to return. With the help of the states of Qi and Jin, he remounted the throne of Wei (r. 546-544). During the reign of Duke Ling 衛靈公 (r. 534-493), Confucius 孔子 stayed in Wei. He refused to instruct the nobleman Kong Wenzi 孔文子 (Kong Yu 孔圉) in the art of war. There was a rift between Prince Kuaikui 蒯聵 and Lady Nanzi 南子夫人, the consort of Duke Ling. When the Prince attempted to kill the Lady, the Duke had him exiled to Song and later to the earl of Zhao 趙 in the state of Jin. When the Duke went to die, he wished his beloved son Zicheng 子郢 to succeed him, but the latter declined and suggested making Kuaikui's son the next ruler. The earl of Zhao planned to bring Prince Kuaikui back to Wei, but Duke Chu 衛出公 (r. 492-481) did not allow his father to enter the soil of Wei. Prince Kuaikui thereupon began to make plans for a to return to power in Wei. After the death of Kong Wenzi, a bondservant of his, Hun Liangfu 渾良夫, had an affair with Kong's widow, Lady Bo 伯姬, the sister of Prince Kuaikui. The Prince promised to pardon him and even to make him a high official, if Hun Liangfu would support him in gaining back the throne. They managed to enter the capital of Wei, where the Prince hid in the garden of Kong's mansion. Lady Bo, Kong Wenzi's widow, forced her son, Kong Kui 孔悝, to join her alliance with her brother. During a banquet, Duke Chu was informed and made his escape to the state of Lu 魯. After some resistance, Kong Kui was able to proclaim Prince Kuaikui as the new duke, Duke Zhuang 衛莊公 (r. 480-478). Duke Zhuang was again forced to flee Wei when the army of Zhao seized his capital after Duke Zhuang had reproached his old host because Zhao used barbarian war prisoners to erect a city wall. Prince Banshi 斑師 was made ruler of Wei, but had to renounce after a short time, because the army of Qi occupied Wei and installed Prince Qi 起 as ruler. After a few months, the nobles expelled Prince Qi, and Duke Chu could return to Wei (r. 476-456). When he died, his uncle expelled the heir apparent and installed himself as Duke Dao 衛悼公 (r. 455-451). For the next generations, Wei was dominated by the state of Zhao. Duke Zhao 衛昭公 (r. 431-429) was murdered by Prince Wei 亹, who mounted the throne as Duke Huai 衛懷公 (r. 428-415), and the latter again by Prince Tu 頹, known as Duke Shen 衛慎公 (r. 414-373). In 346, the rulers of Wei were degraded to marquesses and were mere satellites of the state of Wei 魏. The heir of Marquis Ping 衛平侯 (r. 361-333) was even deprived of a title of nobility and is only called "the Successive Lord of Wei" 衛嗣君 (r. 324-283) - his personal name is not known. Lord Huai 衛懷君 (r. 282-253) was killed, when he delivered tributes to the king of Wei 魏. In 239, the armies of Qin 秦 conquered a great part of Wei, transformed it into the commandery (jun 郡) of Dongjun 東郡, and moved the residence of Lord Yuan 衛元君 (r. 252-230) from Puyang 濮陽 to Yewang 野王 (modern Qinyang 沁陽, Henan). Prince Jiao 角, Lord Yuan's son, was allowed to remain a nobleman in his territory and was only demoted to the status of commoner in 209, long after the foundation of the Qin empire. Wei was therefore the last of the regional states of the Zhou period that was annihilated by the Qin. (Wei Wugong 衛武公) Ji He 姬和 813-758 ? Shiji 史記, 37, Wei Kangshu shijia 衛康叔世家. Luo Shilie 羅世烈 (1992). "Wei 衛", in Zhongguo da baike quanshu 中國大百科全書, Zhongguo lishi 中國歷史 (Beijing/Shanghai: Zhongguo da baike quanshu chubanshe), Vol. 3, 1205.